Lucknow: As Ram Baran’s phone rang loudly, the ringtone went like this: “Ram lala hum ayengey, mandir wahi banayenge. Beloved Ram we will come, build the temple there.” It was a reference to the right-wing Hindu project--supported by the ruling Bharatiya Janata Party (BJP)--of building a Ram temple at the site of the demolished Babri mosque. “They have failed me,” said the illiterate daily wage worker. With a lunch box wrapped in cloth, he travels 9 km one way, changing two buses that cost him Rs 22, until he reaches the city’s largest labour hub, the Chinhat industrial area, where he waits every day for a temporary job. This has been Baran’s routine for two years after he was fired from an electric-rickshaw factory called Srivastava Automobiles, one of many small-scale companies that either laid off employees or shut down after Modi’s November 2016 decision to withdraw 86% of India’s currency, by value. 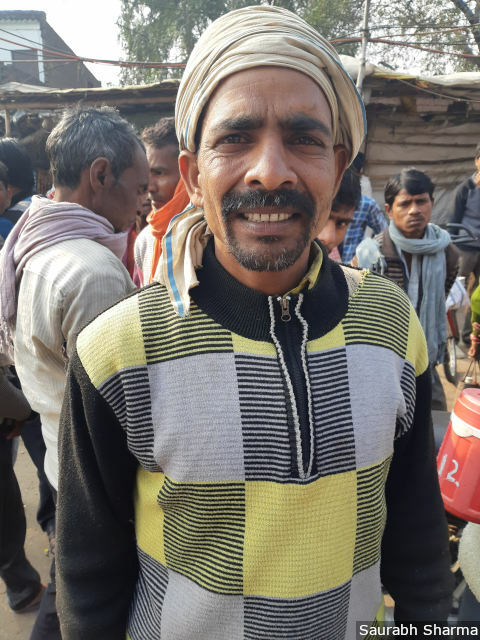 Baran was one of around 3,000 labourers who mourned the loss of financial stability after demonetisation at the Chinhat industrial area in the capital of India’s most populous and politically important state, Uttar Pradesh (UP). While most labourers at Chinhat were from Lucknow, others had come from adjoining districts like Sitapur, Hardoi, Rae Bareli and Barabanki in search of jobs. Some workers--among them graduates, engineers and post graduates--were dressed in torn garments, others wore a mix of worn blazers and lungis. Most held a bidi in one hand and held a small lunch box in the other. Several women joined the throng, dressed in colourful sarees with a loose shirt on top and a child slung over their shoulders. Of nearly 400,000 labourers across Lucknow’s labour hubs in Lucknow, only an estimated 40% find work today, said Ashish Awasthi, a labour rights activist. This is the sixth in an 11-part series (you can read the first part here, second here, third here, fourth here and fifth here), reported from nationwide labour hubs--places where unskilled and semi-skilled workers gather to seek contract jobs--to track employment in India’s informal sector. This sector, which absorbs the country’s mass of illiterate, semi-educated and qualified-but-jobless people, employs 92% of India’s workforce, according to a 2016 International Labour Organization study that used government data. As India begins voting for the 2019 general elections, this series provides a reported perspective to ongoing national controversies over job losses after demonetisation and GST by delving into the lives and hopes of informal workers. The number of jobs declined by a third over four years to 2018, according to a survey by the All India Manufacturers’ Organisation, which polled 34,700 of its 300,000 member-units. In 2018 alone, 11 million jobs were lost, mostly in the unorganised rural sector, according to data from the Centre for Monitoring Indian Economy (CMIE), a consultancy. Home to 200 million people, UP is India’s second-poorest state by per capita income, ranks 29 of 35 states by literacy, according to Census 2011, but because of its size, it has more illiterates than any other states. Coupled with the fact that it has India’s largest youth population (15-24 years), more than 40 million as of 2011, the state--with an economy half as large as Hong Kong, which is smaller than many UP districts--requires millions more jobs. Rudra Pratap Dubey, PhD, a Lucknow-based political expert, estimated that every second youth in the 15-to-24 age group is unemployed in UP. PhD holders, doctors and engineers routinely apply for positions as peons and sweepers. To address widening unemployment, the state government launched two programmes, Start UP India and Stand UP India, but there has been little effect. That victory came at a time when UP’s unemployment rate was 13.25%, on average, between January 2016 and 2017, according to CMIE data, registering a high of 18% by June 2016, five months before demonetisation. This high rate was the culmination of widespread problems that companies faced in renewing leases to industrial land or buying new plots, which resulted in several moving to Uttarakhand or West Bengal, said Neeraj Shukla, an assistant professor and economist at Lucknow’s Khwaja Moinuddin Chisti University. Between January 2017 and July 2018, the unemployment rate fell to an average of 3.9% over 19 months. In August 2018, Swami Prasad Maurya, state labour and unemployment minister, told the state legislative council that more than 2.1 million youth were registered as unemployed in UP. The actual number, he said, was not known. Arvind Kumar Shukla, a labour contractor at Chinhat--who charges a 10% commission for finding a job--said industries prefer using a contractor to hire labour because they can cut expenses, such as bonus and insurance: should a worker demand extras or increased wages, contractors are ready to supply a replacement. The number of labourers looking for work has increased, and industries that use labour contractors pay an average of Rs 220 per day--62% lower than the regular rate of Rs 350--and some desperate workers even agree to work at Rs 150 a day. Workers registered with the government are eligible for various welfare schemes, such as housing assistance (for construction workers), marriage grants for daughters of workers, skill development, pension and national health insurance, according to the Building and Other Construction Workers (BOCW) board.